Out of Milk Shopping List – Let There Be Lists! My head is always in the clouds: I get back from doing a grocery run and *slaps hand on forehead* just as I unlock the door to my flat I realise that I’ve forgotten something. Or I meet up with a friend wanting to return a CD I’d borrowed, and there I am empty handed, having forgotten the darn thing at home after all. I’m sure this type of thing has happened to you as well. Well, that’s where our smartphones come in: to help us dummies keep out of silly situations. Out of Milk Shopping List is the type of app that can help people remember things, so let’s take a closer look, shall we? 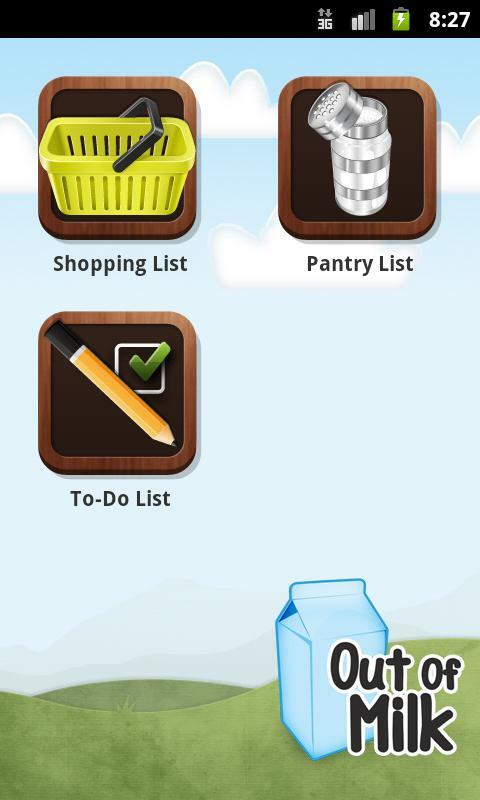 Out of Milk Shopping List lets users create and edit various shopping and to-do lists. Details regarding the prices of products can be added, and there’s an integrated barcode scanner that can help making a trip to the store even faster and more efficient. Out of Milk Shopping List is 3,2 MB in size and supports App2SD. The required permissions are all legitimate. I’ve created a few of my sub-categories for the shopping list section, but the application comes with two-pre-existing lists: ‘Groceries’ and ‘Clothes’. Creating and editing shopping lists is child’s play: there are just a few buttons and everything is totally self-explanatory. New items can be added to lists, either manually or by scanning a barcode (for instance, I went shopping, decided to splurge and buy a pack of bubble gum, scanned said extravaganza and it appeared on my list). The application is very thorough when it comes to specifics: I added ‘bread’ to my shopping list and it came up with a list of different types of bread. Items can also be crossed off your list as you go, you can add details regarding the quantity of items you need to get (1 beer, 6 beers, same difference) and you can specify whether a price includes taxes. If you regularly enter how much a given item costs you can observe price changes or compare pricing in different shops. Out of Milk Shopping List will also calculate your total amount due for you. The pantry list also comes with two preset shopping lists for spices and basics, and in order to help make adding new items to either list easier 30 types of spices and herbs and 40 basics are there for you to choose from. Feel free to add more in case you like to keep your lists as clean and organised as your pantry. The to-do list is very much the same as the other two, except that it doesn’t have any preset lists. Again, it’s easy to create and edit new lists, and in order to keep on top of your schedule there’s an added function that allows you to include dates for reminders. Currencies and tax systems can be set under settings. Certain settings are only available to pro users. 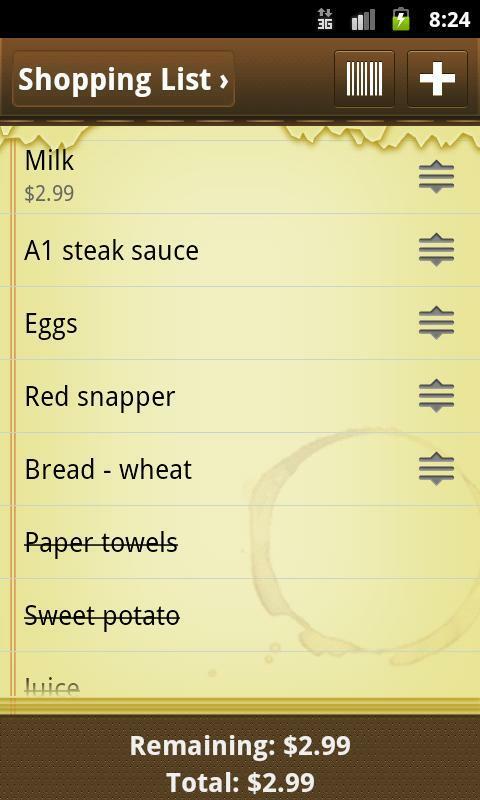 Out of Milk Shopping List is a super useful tool for scatterbrains and lovers of well-organised households. The app does everything it promises to do, and does it well. We appreciate all of the attention to detail that went into this application: from the fun design to the quirky app name, as well as the fact that the develoeprs chose to make the application completely ad free! The Out of Milk Shopping List controls are simple and straight forward. We love the design: it’s not too in-your-face, but there’s a lot of attention to detail and – to my mind – good taste. Out of Milk Shopping List is sturdy and fluid. It performed beautifully throughout our testing phase. Out of Milk Shopping List is available for free from the Market. A pro version that offers a few more features is also available. The icing on the cake: the app does not feature any ads!